Nobody likes a big ugly rubber antenna. 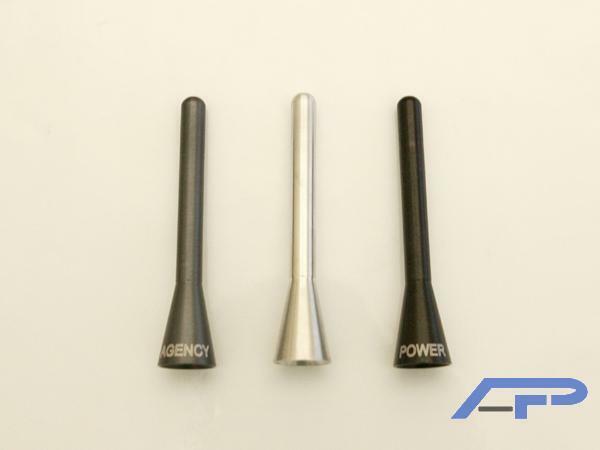 Agency Power has released their brand new shorty antenna available for your tuner car. These CNC machined 6061 aluminum antennas fit in the place of your stock unit. Giving you improved reception and a new style to your car. Antennas are available in gloss black, polished, and limited edition gunmetal for those EVO MR owners. Each antenna is laser etched with the Agency Power text (except polished). These antennas fit the Mitsubishi EVO, Scion TC, Nissan 350Z, VW, Audi, S2000, and other vehicles using similar removable antennas.